It is a good thing I committed to this linky party thing, because I would not have gone back to Eternal Bloom after last month. At least not for a little while! But I had a commitment, so I dug through my pile and found the lowest numbered packet - number two. I don't know if I'm missing number one, or if it's the center block that I haven't tackled yet. Something to worry about in a few months! Anyway, so these lovely little tulips are done, and not quite as big of an ordeal as last month's pansies. However... I'm aware that this is a stitch-and-flip project, and I don't mind little bits off the edges here and there. This block, though, has way more than little bits to cut off. This is the corner block in action. I pieced the entire block on the top left, just to slap two bigger-than-3" black squares on the corners and slice off all that work. And then again on the bottom with the stem! 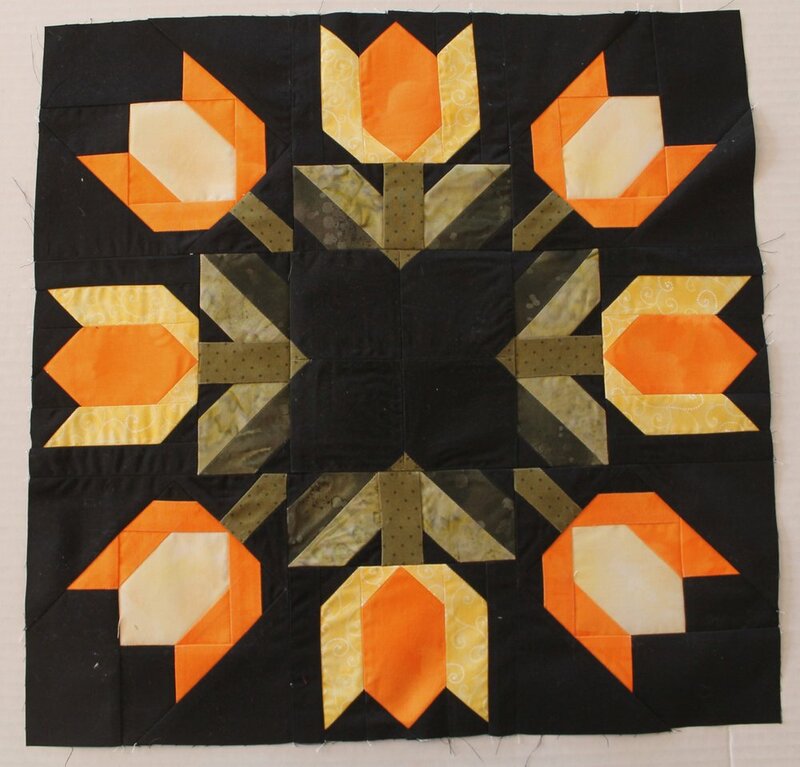 And I would normally double-stitch the squares and save the extra HST, but look at those things on the bottom left! Even I can't make that into a decent block! Anyway, it's done for another month, and maybe next month I'll find the perfect combination of easy-to-piece and not-terribly-wasteful. I hope everyone else's BOMs are going better!